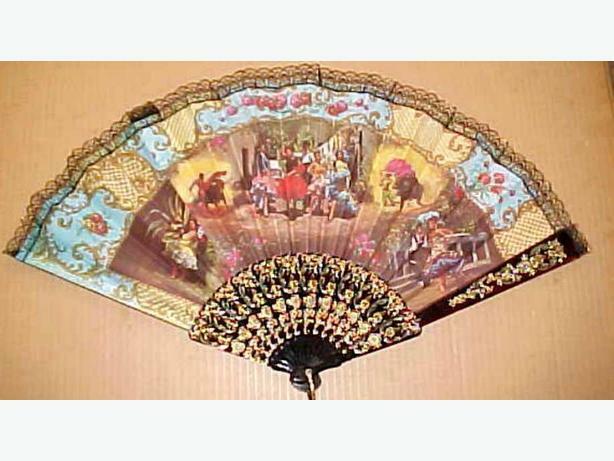 THIS IS A LARGE AND VERY DECORATIVE FAN. IT IS 13 INCHES IN LENGTH AND OPENS TO 24 INCHES IN WIDTH. IT WAS MADE IN SPAIN AND FEATURES SEVERAL DECORATIVE PICTURES ? DANCERS AND BULLFIGHTERS. IT IS IN VERY GOOD CONDITION.